There are times when we may have to travel with our cats on a train. Train is an inexpensive way than a plane to travel other countries or a long distance. 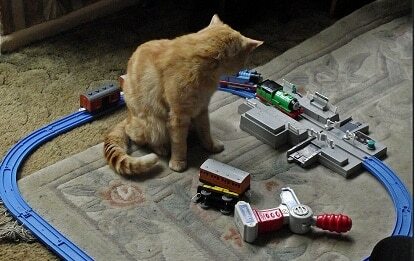 So, it is vital that we know everything about traveling on train with cats. 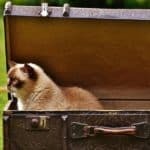 In this article, I’ll explain every detail that you’ll need when you are traveling anywhere on train with your cats. Britain is very friendly to travelers who want to travel with their pets. In fact, all the domestic trains do not take any additional charge for small pets, dogs, and cats. One passenger can bring up to 2 pets. However, you must ensure that the pets won’t cause any inconvenience or danger to the surrounding passengers and the environment. The pets can’t sit on the train seat. Doing so may cause you a heavy fine. The pets need to be restrained in any way. In case of cats, a carrier works fine. You can also use a leash if you want. It can be a bit difficult to travel from Britain to other European countries with our cat by train, as currently, Eurostar don’t allow pets. However, it is not impossible. You can travel from Britain to Netherland with your cat by train and ferry. First, you need to take a train from the London Liverpool Station. The destination will be Harwich. At Harwich, there is an overnight ferry that goes Hoek. Take that ferry. The pets need to be restrained. It is better if you carry them inside a carrier as most travel policies don’t allow any pets otherwise. France: Though pets are permitted on board by most trains, you’ll need to pay an additional charge for each pet. Spain: only small pets are allowed to travel by train. Pets that weight more than 10 kg won’t get the permission for traveling. Germany: You’ll only need to pay the fare for large pets on a leash. For small pets inside a carrier, there is no need to pay an additional charge. Italy: most pets are permitted for traveling in Italy. Moreover, the charge is free if the pet is inside a carrier. TGY Lyria: if the pet is less than 6 kg, then it can travel without any additional charge. Each passenger can bring maximum 2 pets with him. If the pet weighs more than 6 kg, there will be an additional charge and also, the pet needs to be muzzled. Virgin Trains: one passenger can bring 2 small pets with him. If the destination is Scotland, there won’t be any extra charge. Thalys: Small pets can travel without any charge. But they must be inside a carrier. Large pets need to be muzzled. Also, there will be an additional fare for large pets. Thello: if the pet weighs less than 5 kg, then there won’t be any charge. Also, no reservation is required. One passenger can bring only one pet with him. The pet must be inside a carrier. Pets that are over 5 kg should always be accompanied by its owner. Renfe: most small pets are allowed inside Renfe trains such as cats, ferrets, dogs as well as birds (not chicken though). The pet needs to be less than 10 kg and must be inside a carrier. SNCF: this is a French railway. Pets that weigh less than 6 kg must be inside a carrier. There is a small fare for small pets. In case of pets weighing more than 6 kg, you need to muzzle them. OBB: only pets that are well-trained and well-behaved are welcome to aboard. Small pets can travel without any charge, but they must be carried inside a carrier. Larger pets need to be muzzled. Also, there will be an additional charge for each large sized pet. You need to fully prepared for the journey. Plan your month ahead considering the day of traveling. Keep your tickets, passport and any other document that you may need ready. There shouldn’t be any hurry in the day of traveling. Also, make your cat adjusted for the traveling. If she hasn’t traveled anywhere before, it is high time to make her get adjusted to a cat carrier. You can do this by following this article. Also, make sure your cat is fit for long distance traveling. 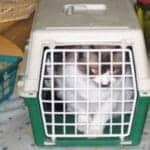 It is recommended to ask a vet beforehand if the travel will pose any problem to the cat. Also, take necessary medications for your cat (if she needs any). Cats are animal of habits and comfort zone. They don’t like being in a situation outside of their comfort zone. Traveling is a completely unknown experience for them. So, it is normal for your cat to behave in a bizarre way during traveling. But we can make our cat prepared in advance for such an incident. Weeks before the travel, start training your cat to be in outside, travel inside a car etc. First, make your cat comfortable being inside its carrier. You can do that by following the tips mentioned in this article. Then take your cat to practice car rides. 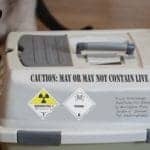 Make sure the cat is inside its carrier. First, make the rides small and quick. Gradually increase the duration and distance. If your cat shows positive behavior during traveling, encourage it by giving her a treat. Thus we can gradually prepare our cats for any long distance traveling. But one thing to keep in mind is, no matter how much we prepare, there is no guarantee how a cat will behave on an actual long distance journey. During the day of the travel, everything should be ready and close to your hand. Keep all the necessary documents organized and at a place where you can access them easily. Leave early from the home so that there is enough time even if there is traffic on the road. You shouldn’t hurry and panic in any case as your pet will sense that and get stressed too. If there is enough time when you reach the station, find a quiet corner where you can wait with your cat for the train. Avoid any place that attracts unnecessary attention to your cat. Also, keep a safe distance from the rail tracks for the safety of both you and your cat. When the train finally comes, wait until all the passengers have left. Then gently pick the carrier and aboard the train in a systematic way. Don’t rush anything or panic. Always keep your cat beside you.